A NEW air recirculating oven from B&L Tetlow utilises the full benefit of the innovative Certek top coating system for the manufacture of glass products, according to Tetlow manager Roger Brockway. Equipped with Certek coated blanks, the new oven eliminates the need for manual swabbing, sharply reduces ware losses and allows knockouts to be salvaged. The oven is capable of heating a 2-tonne load of ‘blanks’ to 550ºC on a continuous 4-hour production cycle. "Our new air recirculating oven allows users to gain the full advantages of the recently introduced Certek mould coating system -- a mould coating which, along with a number of other benefits, eliminates the need for ‘swabbing’ or the periodic manual application of a release agent to the moulds," Roger Brockway said. Swabbing requires an operator to apply a compound to the moulds over periods that vary from about seven to twenty minutes. The release agent is carried on a cotton pad and applied directly to the mould blanks. It incurs loss of product each time moulds are swabbed in addition to operational cost factors. Excessive coating can cause jam ups which damage mould blanks while too light a coating can cause temperature gradients which result in defective glass parts. A new mould coating introduced by the American company Certek Ceramic Technologies allows a user to apply a long lasting impervious coating to the glass mould blanks. The coating is applied by a process similar to a two coat spray painting followed by a heat curing. The coating technology uses a matrix of hard ceramic particles interspersed with soft, inorganic lubricants. Once the Certek coating is baked on, no ware is lost during start up and the coating allows continuous production for very extended periods. In addition to very substantially increasing production outputs, the coating does not generate emissions, a problem with traditional methods of glass production which generate high levels of hydrocarbon emissions. Designed specifically to maximise benefits generated by the Certek process, the new oven incorporates a number of advanced design features. These include element control by way of a DCV fired solid state relay which achieves tight control as the relay is capable of switching very rapidly to prevent over runs of temperature. The new unit also features a new impeller manufactured from 253 MA heat resistant stainless steel. The fan rotor is fixed to a high temperature stainless steel shaft which passes through the insulation and is fitted with two special heavy duty bearings. A cooling fan is mounted on the fan shaft between the outer skin of the oven and the inner bearing in order to continuously disperse heat from the shaft. A Shimaden FP 21 92mm 2 type K microprocessor provides a digital display on ongoing process, set values and auto tune function of PID parameters. 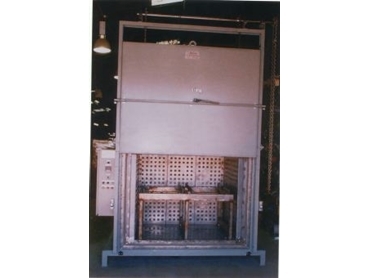 The controller allows multi segment program controlled firing for both heating and cooling cycles providing firing times are within the parameters of the furnace and its load. The programmer has nine programs each with nine memory segments and all programs can be linked to provide a single 81 step operation. B&L Tetlow 03 9877 4188.